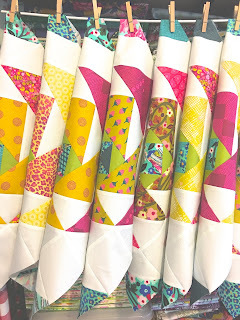 Surround yourself only with things that are beautiful and things that are useful..
Well its my turn on the "Whirly Girl Quilt" Bloghop - lucky last!! Its been quite an adventure, and I've loved seeing all the different versions of the quilt over the past couple of days. I had a lot of fun pattern testing and creating my version of Allison's aka Campbell Soup Diary's new design, "Whirly Girl Quilt". 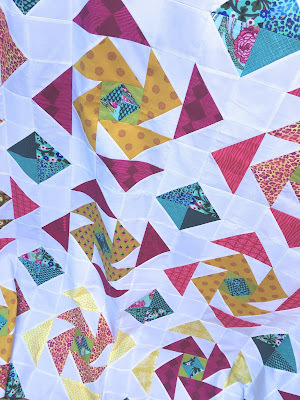 Allison's pattern is easy to follow and it has great pictures and diagrams to help you along as you make the quilt. I found the pattern very thorough and her attention to detail really made this quilt a quick and easy one to make. 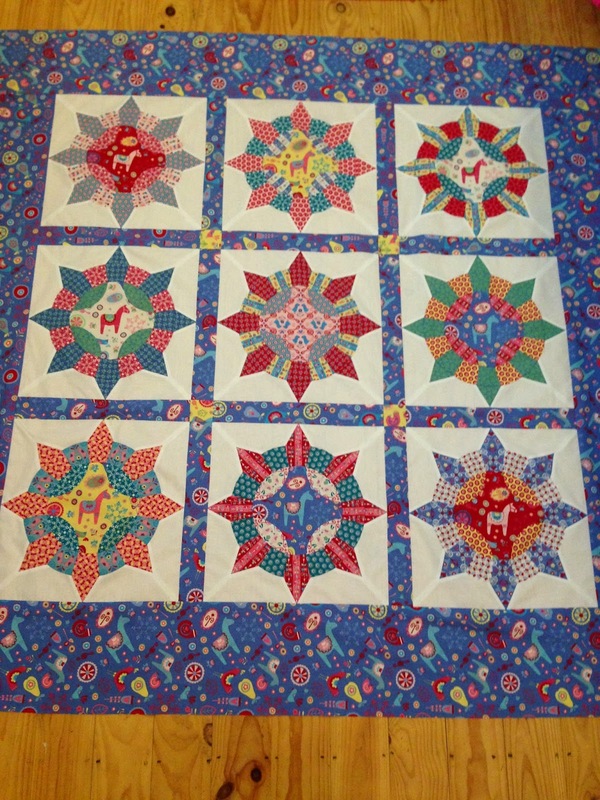 So here's my version of the "Whirly Girl Quilt". 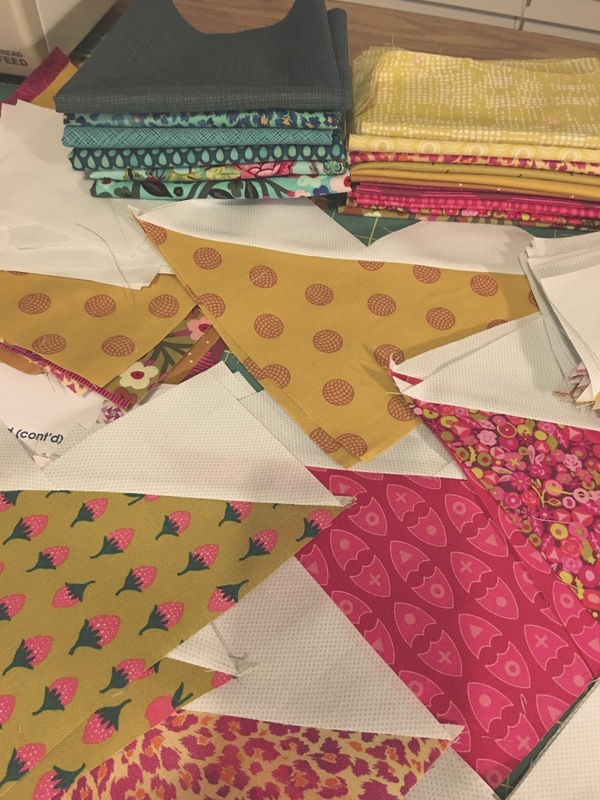 My best friend and fellow quilter, Tanya and I had a blast trying to select the fabrics for this quilt, the staff at my local patchwork shop had fabric stacks everywhere, as we curated the perfect bunch of fabrics. 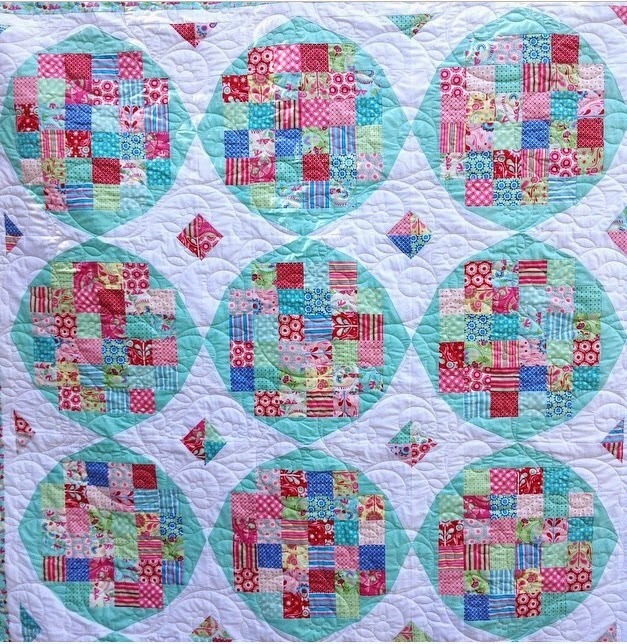 I decided to go with hot pinks and mustardy yellows, with the addition of teals to create a bright and funky quilt. A great contrast of warm colours and cool colours. There are fabrics from Art Gallery, Alison Glass, Monika Forsberg, Tokyo Milk and a few others. 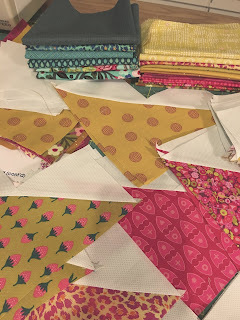 I set out making the quilt, using the teal fabrics for the centre broken dish blocks and the cornerstones, and using the warmer colours for the flying geese blocks, mixing up the hot pinks and mustards to form sets, so that they were ready for piecing together. For my background fabric I chose a pale aqua spot on white, its so pale you can hardly see it, but it works in very nicely with the colours of the quilt. The background fabric is from the fabric range called 'A Day In The Country'. Once the blocks were finished, I just had to lay them out and take a photo as I thought they looked so yummy! 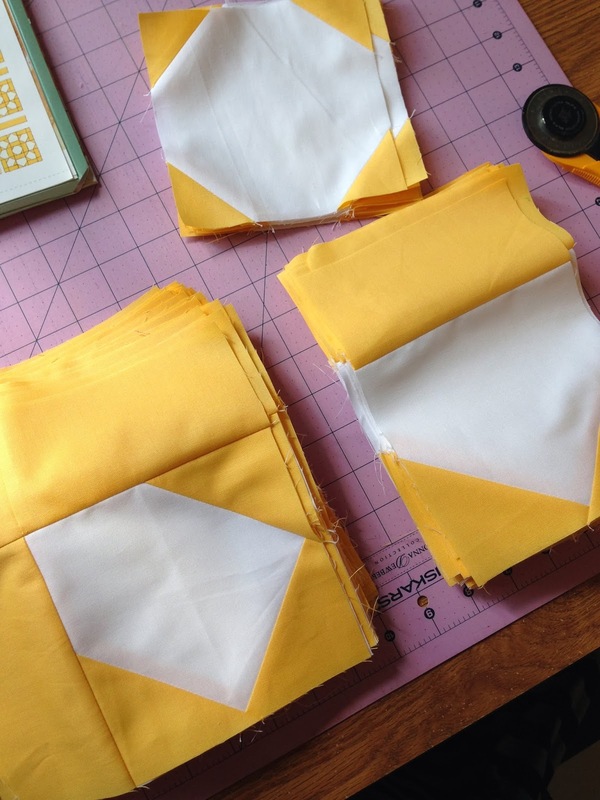 I spent the past weekend at our Guild meet up,sewing all the blocks together to finally have the quilt together. I love it! The colours just sing! If you want to make your own version of this stunning quilt, don't forget to pop over to Alison's Payhip Shop for that 20% discount until March 24th. 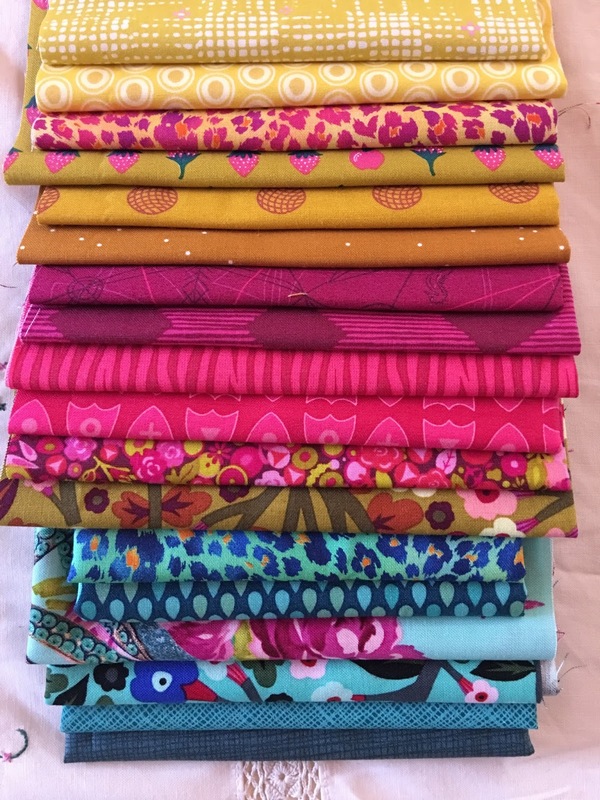 I've been enjoying myself lately by making sample quilts for Ella Blue Fabrics, and using the lovely fabric ranges "Nellie Hill" and "Folk Festival" by Rosalie Quinlan. 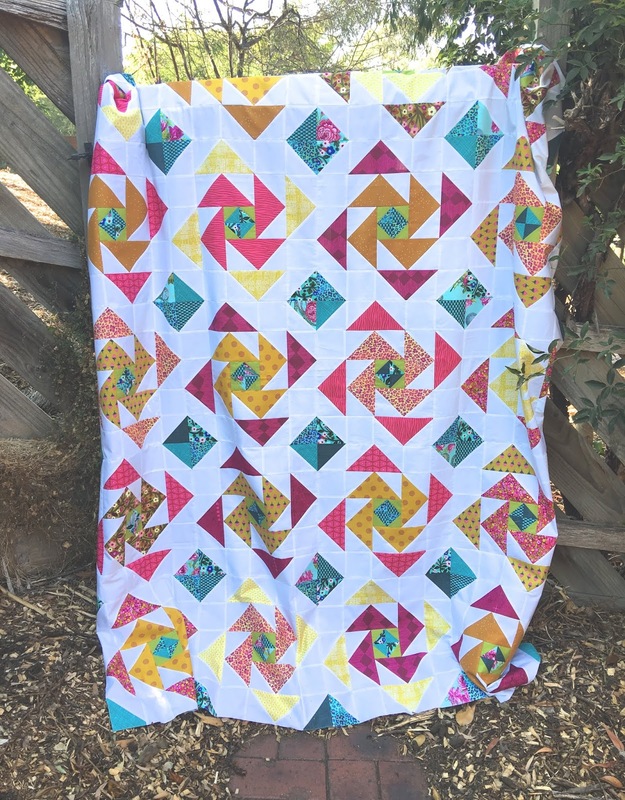 I have made this quilt called, "Carousel" and is a simple churn dash quilt with strippy scrappy borders, and I'm in the process of writing a pattern for those of you that want to make your own, this should be ready to be released in December. 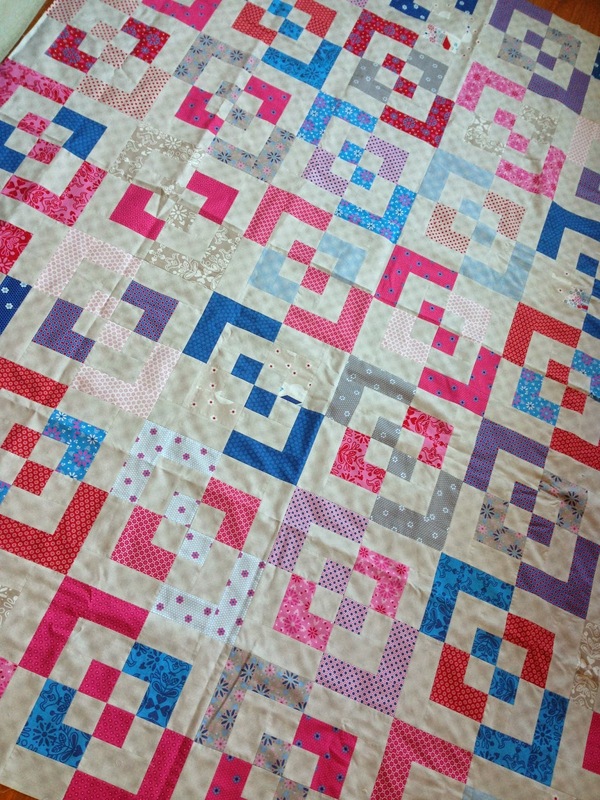 I have also made this quilt which is a pattern by Michelle Marvig, called "Fresh Fraise", and it uses the Strawberry Template, both are available through the Ella Blue Team!! 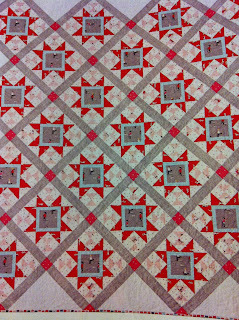 This is my quilt called "Confetti" using all the fabrics from the Nellie Hill range and using a light grey homespun as the background fabric. It has created a soft and feminine look to this fabric range. 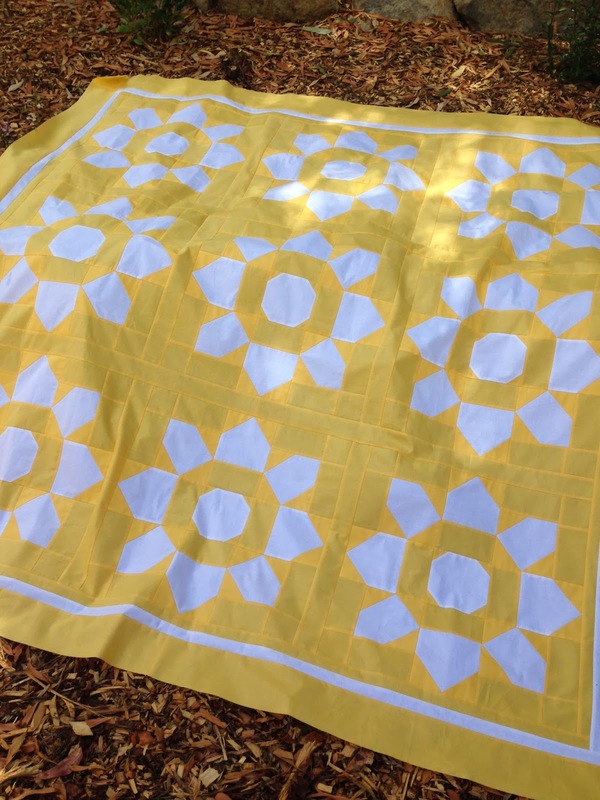 I am in the process of writing a pattern for this quilt too, due out in December. 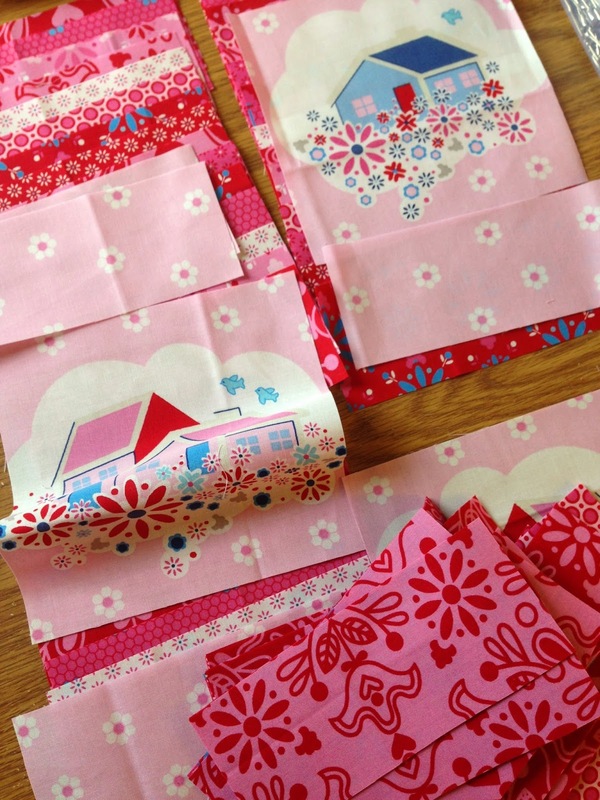 Then I decided to make a little girlie quilt using just the pink fabrics from this range and featured a few of the little houses into the panels. I have loved making these quilts and it's been a real pleasure working with the Ella Blue Team!! 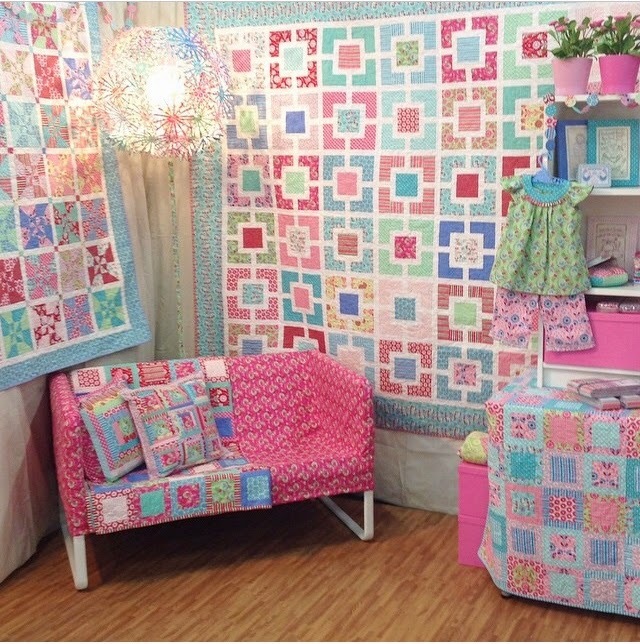 I am so excited that this year I have a few quilts going to Quilt Market with the Ella Blue Fabrics Team. I have been busy making quilts for the talented Rosalie Quinlan using her new fabric line "Chirpy Lola" to showcase her fabrics at Market this October. This one is "Lola's Garden", and the pattern I used was Cindy Lammon's Garden Lattice quilt, from her book 'Simply Modern Christmas'. 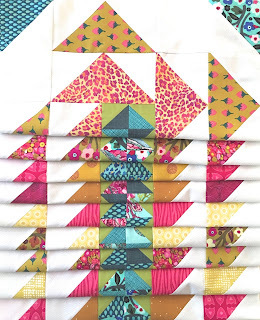 I have made this quilt three times now and it is a quick, easy and a great quilt to show off a full range of fabrics. And this quilt is my own version of a quilt that I saw and re-worked, this one is called "Freyja's Flower Patch", a little bit trickier to master but a great quilt to make. Pattern will be released in December, ready for Christmas. 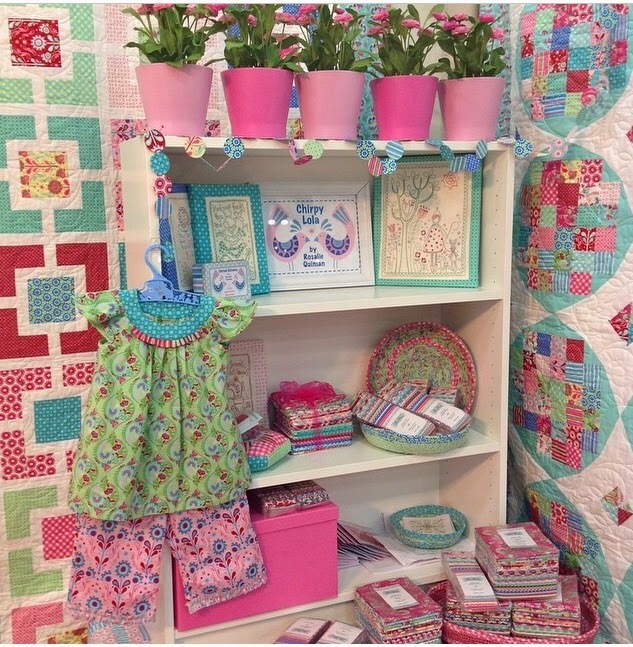 Congratulations to the whole team at Quilt Market this year, the booth looks amazing and I have truly loved making quilts for this amazing Aussie Team!! Is the world of blogging coming to an end, with the introduction of Instagram? 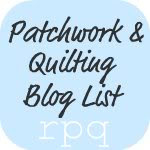 I hope not, I love spending lazy days reading through my favourite blogs, to see what people are up to and looking at inspiring quilts and who has made what and how they were created. I absolutely love Instagram, and it is my daily quilting fix, as I pour over photos of quilts, fabrics and family snapshots, and be totally inspired for the day, sometimes it even gets me out of bed and onto the sewing machine, but I still find that blogs give you a greater look into what someone is creating. You can add lots more photos and heaps more writing and notes, it is more like a journal. So I will do both! I must admit I have been pretty lazy when it I come to my own blog, so I thought today as I'm home sick that I would freshen it up and give it a face-lift. Ive kept it pretty basic, just focusing on what I believe is important to me, and to you the reader. 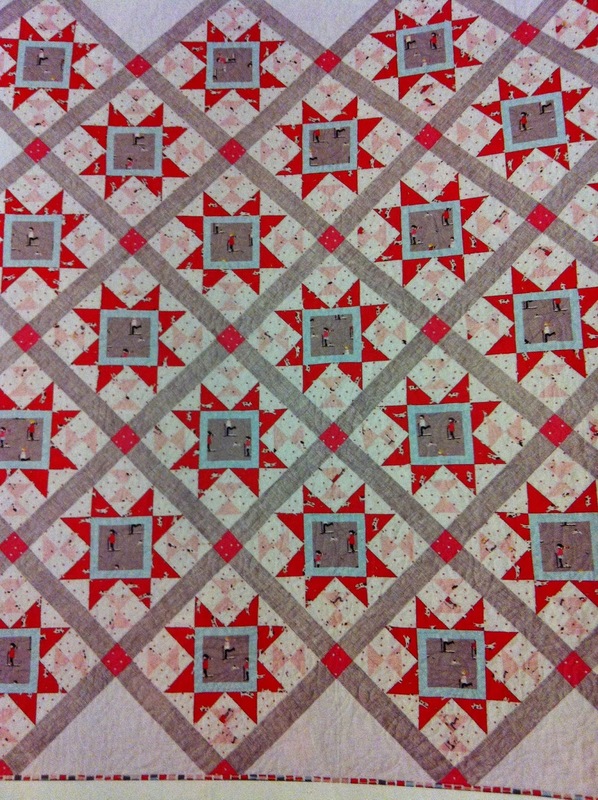 Here you will find snapshots of quilts that I'm working on at the moment and pictures of beautiful fabrics. I have also included in the sidebar a quote of the day (which may end up being monthly, knowing me!!) I have also included my favourite blogs, which I'm sure there are many more to add. I am also thinking of doing a favourite of the month, be it a store, a blog, an Instagram link or whatever, one that has inspired me and I hope will inspire you!! To those that blog regularly, please keep it up, as you offer wonderful inspiration everyday! And it also just happens to be one of our hottest summers yet!! It has been reaching 44C or 111F, for those in the US!! So I earmarked it for my holiday quilt.... 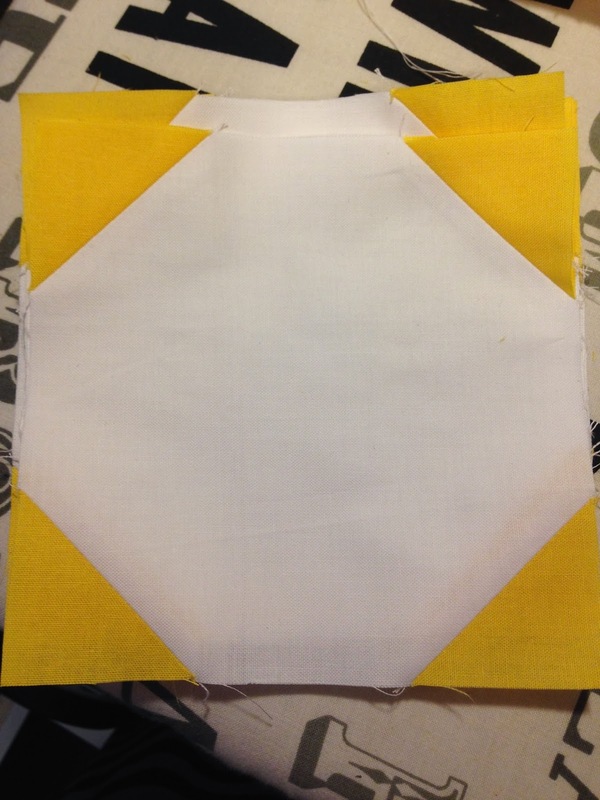 I chose a beautiful buttery yellow and a clean crisp white homespun in which to make my quilt. 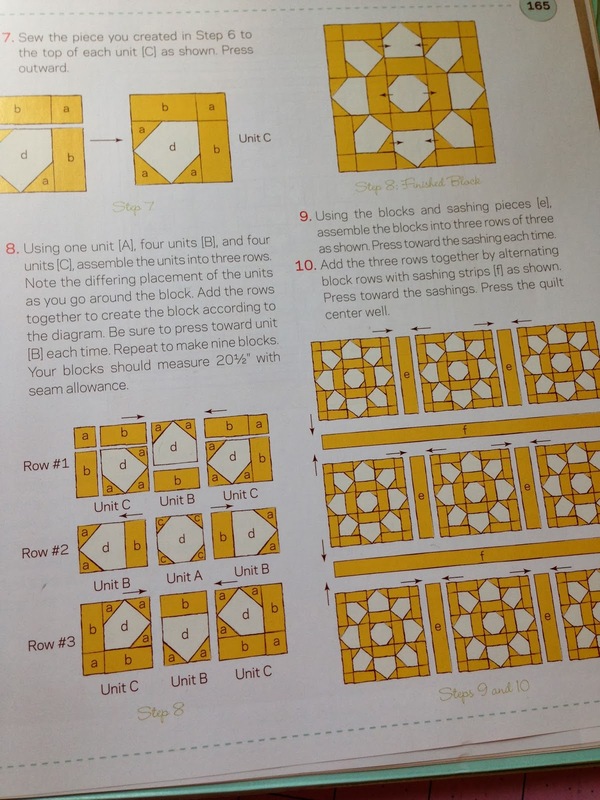 Here are some of the steps I took to make it....no instructions, just pictures, you can find all the instructions in the book!! Which I must admit the book is beautiful!! And no coincidence the instruction were in the colour way that I chose, the original is in a grass green colour!! 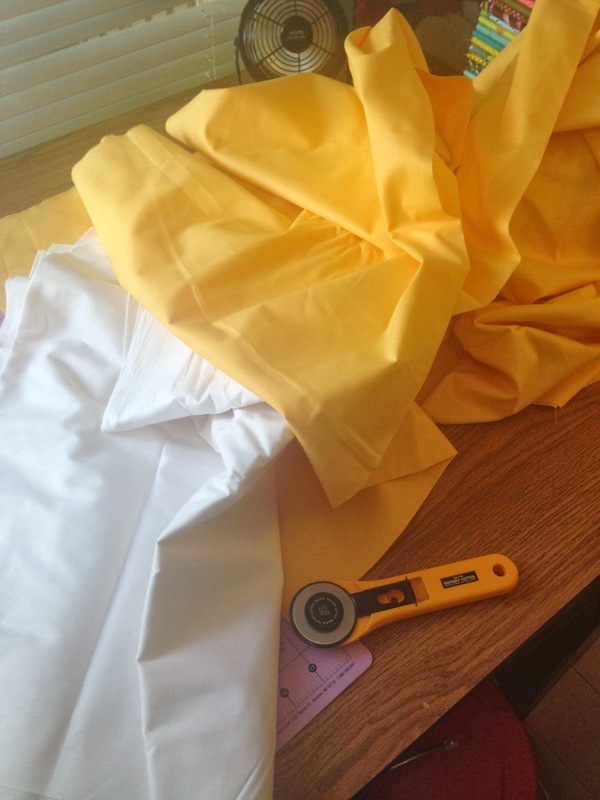 I picked the fabric before I looked at the instructions again!! Haha!! I made the complete top in 2 days.... now that's quick!! What do I make now?? Welcome to Alaric Mannan.... my Grandson!! Well I haven't been around much lately, but for those that follow me on Instagram = (lyrebird_lamb), you'll know that I have been busy preparing for the arrival of my first grandson. 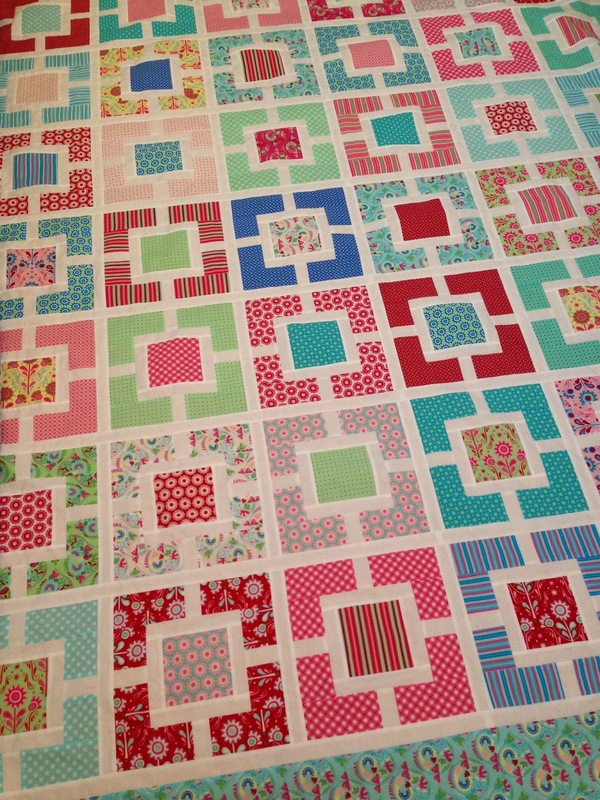 I have been making quilts and clothes, sheets and quilts, bunting and all sorts of fun baby goodies. I have also held a baby shower for my daughter and organised everything for this event, from cupcakes to sausage rolls and lollies and of course the cake!! We even had a competition on who could create the cutest onesie!! We have had a fun few weeks..... and then he arrived....early!! 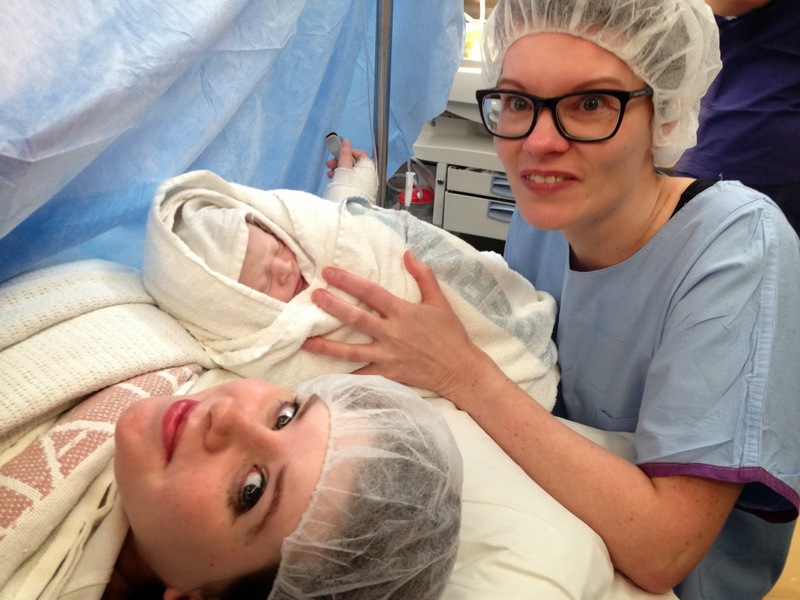 Welcome to my grandson "ALARIC MANNAN".... born on Christmas Eve, 24th December at 1.45am weighing in at 7lb 8oz. So Proud!! I promise I will try and post more regularly than I have and let you into my world of quilting and life!! You may have thought by now, that I had left the country or something, as I haven't posted on my blog for so long, but the truth is my daughter's computer broke, so being great parents, we gave her ours (my husband's and mine!! ),to use, so she could watch movies and keep in contact with friends, and we both have IPads that we use. BUT, while I could write on my blog, my Ipad would not let me upload photos to add to my blog, so I gave up for awhile...but today I really needed to get on a REAL computer to pay the bills, so I thought I would steal 5 mintues to blog and let you know whats happening in my life. I'm going to be a Grandma, yes, I'm 46, and going to be a nana!! I'm so excited!! Can you tell!! My youngest daughter (the one who has our computer) is having a baby!! She is due in January and will be living with us, which is fine by me as I will get to cuddle and love this baby everyday. (There's a long hard story behind the scenes, but all will be okay in the long run.) OH! And she's having a BOY!! I recently re-painted her bedroom gray with white trims, and we have added splashes of red and aqua. 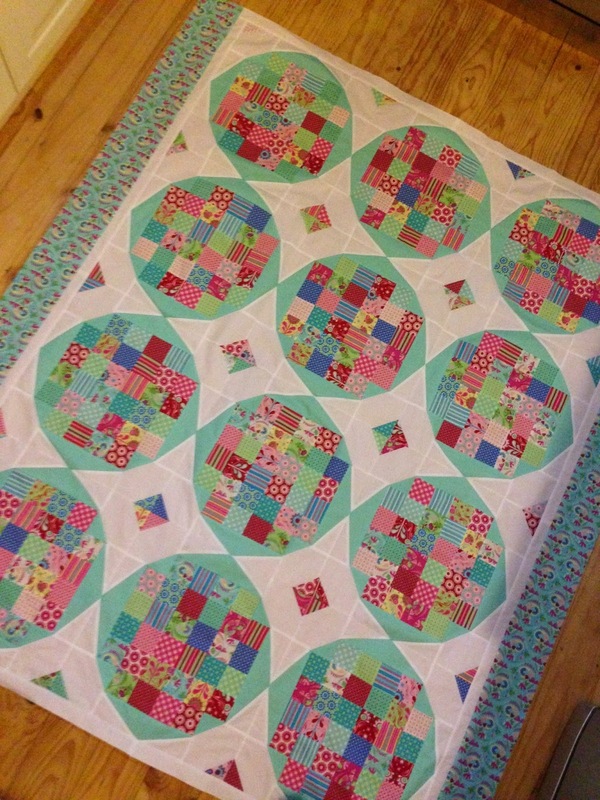 So my version of the 'Pinwheels' quilt looks perfect hanging over the cot. My daughter has her 'Scoot' quilt on her bed. We are still in the process of making some new cot sheets and baby clothes, but I'm having fun making all those little things again!! Colours and Styles that are Inspiring!! 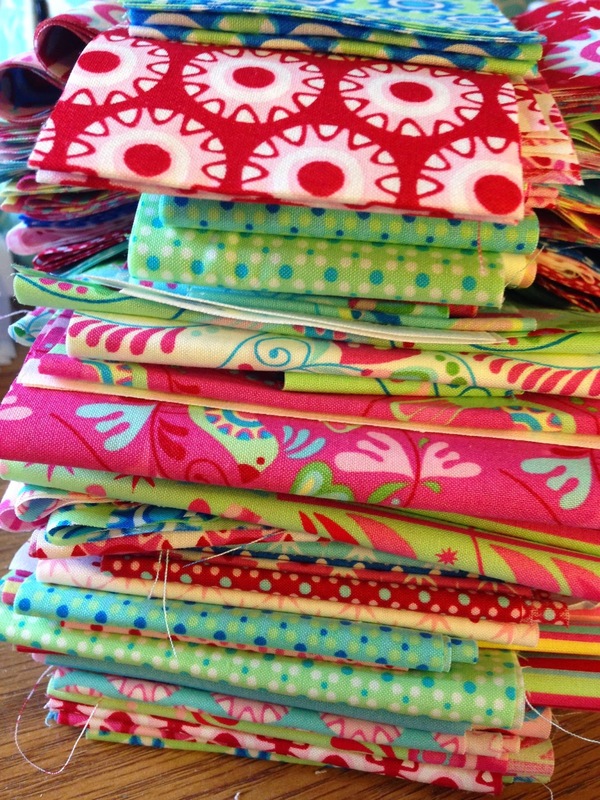 I would have to say I am a fabric collector. 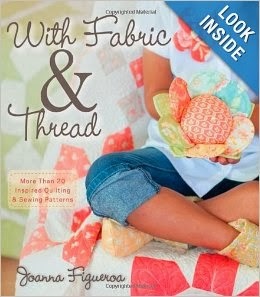 I love quilting and anything to do with working with fabric and thread. 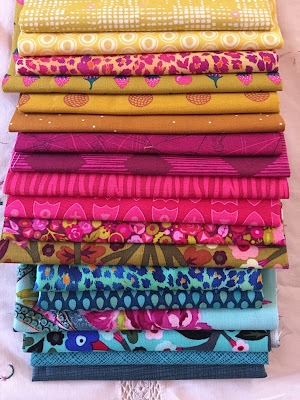 I have a very ecletic fabric stash, anything from Tula Pink, AnnaMaria Horner to Bonnie and Camille, AGF, Amy Butler and Heather Bailey. 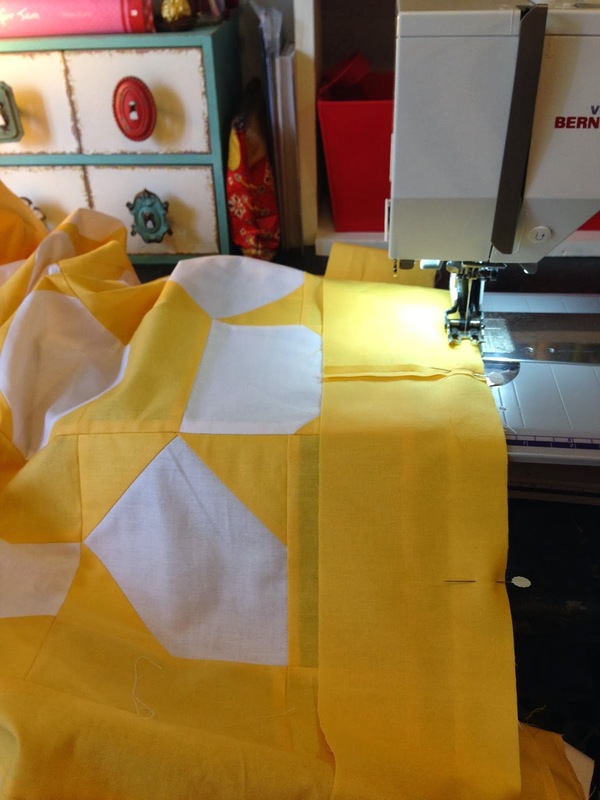 LongArm Quilter that specialises in Edge to Edge Quilting. My Latest Work..that I have finished!! Country Threads Vol 9 No 7 pg 44 "An Ode To Mum"
Country Threads Vol 9:5 pg 26 "An Apple A Day"
Homespun Vol 9:9 pg 79 "A Slice Of Heaven"